Oysters play an important role in the ecology of estuaries by cleaning the water through filtration, with each oyster being able to filter pollutants from as much as 30 quarts of seawater an hour. 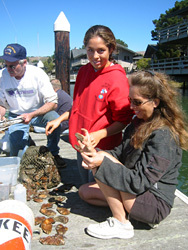 While at one time oysters were abundant in Richardson Bay, the Forty Niners’ appetite for the delicacy along with silt deposits caused by their mining in the Sierra foothills brought the native oyster—the only one that can reproduce on its own in the Bay waters—to the brink of extinction. When scientists discovered a few previously unknown colonies, they developed a theory that placing the shells of larger, commercially grown oysters in the Bay would provide a place for the larvae to settle and grow. The Tiburon Peninsula Foundation helped them test the theory. Volunteers from the Tiburon Peninsula Foundation and Richardson Bay Audubon Center assisted Dr. Michael McGowan and Holly Harris, a graduate student from San Francisco State, in placing pallets of shells in six different locations by Blackie’s Pasture and the Lyford House. After a few months, to everyone’s delight, colonies of native oysters were growing! The effort to restore the oysters continues and has expanded. The Richardson Bay Audubon Center and Sanctuary is looking at settlement and recruitment inside and outside eelgrass habitat, and at different depths, searching for habitat availability in front of Lyford House and at Blackie’s Pasture.